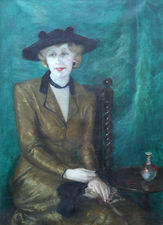 Eileen May Wyon (1883-1969) was a painter in oils chalk and charcoal of portraits. Studied Dublin School of Art and Royal Academy Schools under Sir Arthur Cope Lived in Dublin from 1905 and London 1907. Exhibited at The Glasgow Institute and the Royal Hibernian Academy. She exhibited nationally (GI, RHA) from 1905-1928, and married Allan Gairdner WYON. It is not clear from extant records how frequently she exhibited her work, or even continued to work. However, she exhibited Spring at the NAG Exhibition of 1937, and worked closely with the committees supporting and sustaining the Newlyn Art Gallery through the war years. She died on 26 April 1969 at Great Shelford, Cambridgeshire.